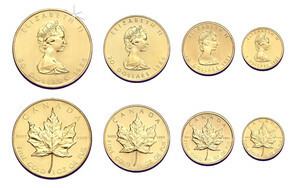 The "Gold Maple Leaf" is representing gold in its purest form. It is minted in the national mintage institution of Canada, the Royal Canadian Mint / Monnaie Royale Canadienne. The correct weight and absolut purity of each coin are guaranteed by the state of Canada. As motive, the Maple Leaf has the Canadian maple leaf and on the other side an effigy of Queen Elisabeth II.